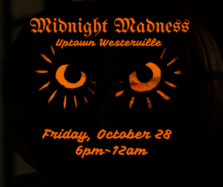 It’s the spookiest night of the year in Uptown Westerville! Save the Date for Midnight Madness in Uptown! It’s the spookiest night of the year in Uptown Westerville! On Friday, October 28, from 6pm-midnight, grab the family and wander State Street in costume, enjoying trick-or-treating and other seasonal festivities at all of the Uptown Merchants.